(a) General: The Committee shall be responsible, in consultation with management, for recommending to the Board the appointment of the independent reserves evaluator(s) and for oversight of the independent reserves/resources evaluator(s), including the work of the independent reserves/resources evaluator(s) in preparing the evaluation of the Corporation's reserves/resources data. (b) Scope: The Committee shall consider, in consultation with the independent reserves/resources evaluator(s) and management, the scope of evaluation and plan of the independent reserves/resources evaluator(s). (c) Resolution of Disagreements: The Committee shall resolve any disagreements between management and the independent reserves/resources evaluator(s) as to reserves/resources reporting matters brought to its attention. 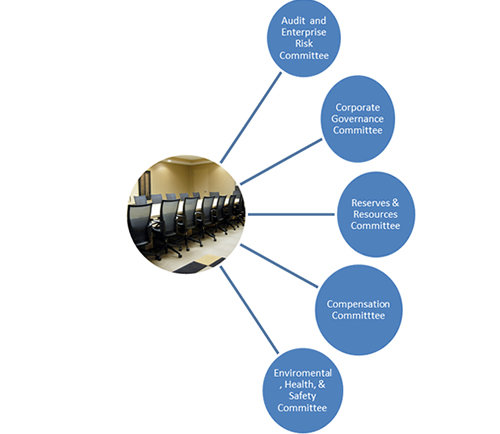 (d) Meetings: The Committee shall meet separately with the independent reserves/resources evaluator(s) and management, as necessary or appropriate, to discuss any matters that the Committee or either of the independent reserves/resources evaluator(s) or management believes should be discussed privately with the Committee. The Committee shall meet separately with the independent reserves/resources evaluator(s) at least annually to determine whether there were any restrictions whether or not such restrictions were placed on the evaluator(s) by management that affected their ability to report without reservation.